Al Borgo Medievale Guest House is located in the heart of the small medieval town of Castelmola. The guest house offers 7 rooms with bathroom, TV, air conditioning, and a terrace. Their furniture is inspired by the medieval legend of King Arthur. Two of them are Superior Suites and have an independent entrance. 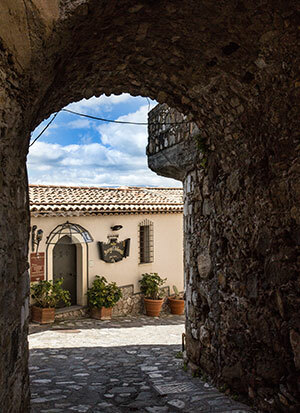 Our Spa Boutique " La Roccia di Cristallo" adds something modern to this medieval atmosphere: jacuzzi, sauna, emotional shower and Turkish bath, will improve your holiday's experience and relax. Al Borgo Medievale is located next to the main square of the town, and overlooks the wonderful surrounding landscape. We'll be glad to welcome you to our facility for an exclusive and unforgettable holiday. 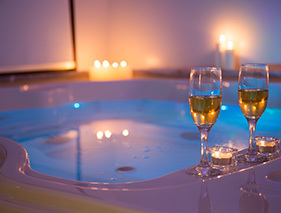 Spa Boutique "La Roccia di Cristallo"
It increases your relax and wellness by exploiting water pressure. The high temperature helps your circulation and soothes your muscles. It also reduces cellulite and improves your legs' tonicity. If you sweat, you'll free your body from impurities and improve your skin. People don't sweat enoguh nowadays due to deodorants, pollution, synthetic garments, no exercise. This may increase toxins in your body, which is why sauna is one of the best natural ways to improve your skin oxygenation. An emotional shower is different from other types of showers: it's not just water, but also colours, lights and flavourings, which will increase your wellness. Water will purify and and detoxify your skin and body, which will improve your blood circulation and soothe your muscles. Loved by the Greeks, the Romans and other Mediterranean peoples, its 100% humidity and 48 °C make it different from a sauna experience. Breath, sweat and detoxify your body. The Turkish bath is one of the best therapies to fight the daily stress and tensions; it's also a good way to improve your physical appearance and your respiratory tract activities.